Open 9:30-5, Mon-Sat. Closed Sundays and major holidays. We are located at 120 Central Avenue, in downtown Coos Bay. Directions on Google Maps. Located across from the Visitor's Center on Highway 101. Look for the building with the blue awning. We are three doors down from the corner. You'll see our purple sandwich board on the sidewalk outside our door. Having trouble finding us? Give us a call! (541) 267-0749. We will be happy to give you directions. No parking? Park at the Visitor Center and cross 101 on foot. 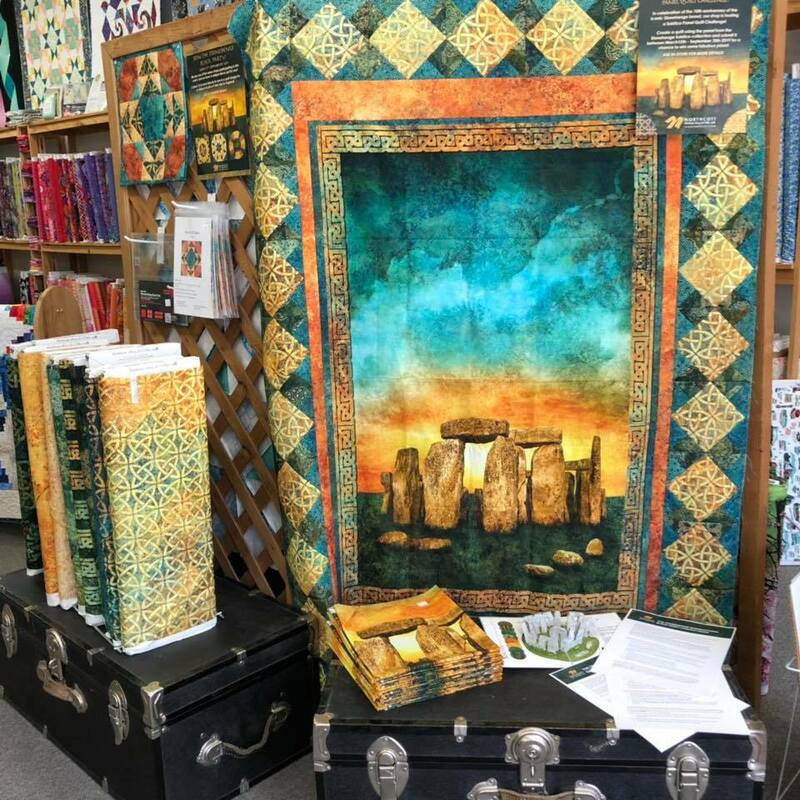 We are excited to be participating in this celebration of the 10th anniversary of Stonehenge Fabrics - come join us to win some fabulous prizes! Come in on Friday, March 15 to purchase your block kit, or panel and start creating! If you can’t make it into the shop, preorder the Stonehenge Block Kit from our online store. Orders will be shipped as soon as the fabrics arrive as we have sold out of the first batch we made. Each participating shop is designing and selling kits for a unique block. Click here to check out the list of participating shops. Visit them all, and collect these limited-edition blocks! Use 12 or more different blocks in a quilt design and you can win a trip to Stonehenge. 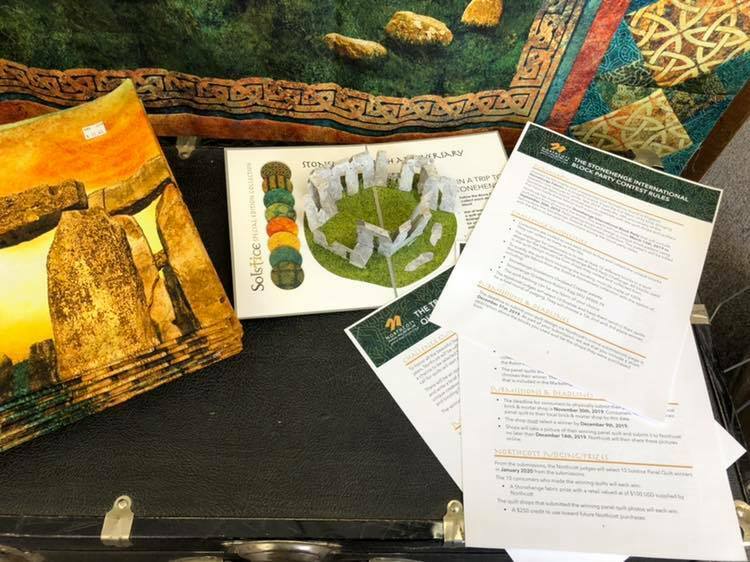 Click here to read the full contest details, and find more information about the Stonehenge Block Party. We have kits available for the 2018 row. Kits include all the fabric, plus a mini license plate. Stop by to pick one up, or click here to order one from our online store. We have the new String Frenzy book in! We also have the Essential Triangle tool as well as the Mini Folded corner tool for this year's Good Fortune Mystery. See Bonnie's Blog for the Instructions and fabric amounts... We are having a kick off event on Black Friday, if you would like to cut and sew along with a group, Pam Boatright will be here in the morning, and Melinda may be here in the afternoon! We've pulled a basket of fat quarters in the mystery colors and would be happy to help you choose some fabrics if you need to add to your stash for your quilt. Sign up for our newsletter and save! Click here to sign up for our newsletter. New subscribers get a coupon for a 10% discount! We are participating in the Southern Oregon Coast Charm Trail this year. We have a cute charm - it costs $2.00, and would be a perfect addition to your bracelet. You could also use it to adorn a quilt or make a bookmark or another fun project with it! There are also hidden charms... ask us for more information. We offer patterns (PDF and printed versions) and kits for sale online. Each item is hand-selected by our employees, and many items are exclusive to us, and are only available through our website. Check out upcoming classes, held right here in our store. Got a request for a class we should offer, or an idea for a class you want to teach? Let us know! We carry over 1200 bolts of fabric and a number of basic notions in stock. We also have a large selection of patterns, including several that are by local designers. We offer Machine Quilting services and lessons as well. Every Wednesday we have a special during the Farmer's Market. Stop by to see what's on sale, or sign up for our newsletter to find out ahead of time.